Summer is really the most awaited season of every year. It is the perfect time to roam the beach, take a dip in the pool, and just laze around under the sun all day wearing your favorite sundress. However, this is also the time when your hair becomes frizzy and dry because of too much heat, and this is a no-no for ALL girls. Luckily, Pantene has introduced their 3-minute miracle conditioner to the market that can help keep the hair smooth and silky, and even added fancy sunglasses in the package to complete the look. Seasonal, But Not So Much. This is a summer promotional gift. Yet, since the frame of the sunglasses do not have designs of palm trees or oceans or flowers – only solid black – they can be worn even during winter, spring or fall. This is what you should go for if you want a marketing idea that works. Garner More Loyal Customers. 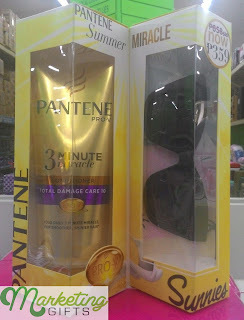 Pantene is a trusted brand, without a doubt. It has loyal consumers already even with no promotional merchandise, but the brand can garner more clientele because of this new marketing strategy that a lot of people can find attractive. High Quality and Affordability Matters. These free sunglasses are said to have the special capacity to protect one’s eyes from UV rays, which not all eyewear can do. This high-quality and affordable product will be a great pull for more sales. Feel free to visit our blog or contact us whenever you want to know more about promotional ideas.